Sunday morning as I was heading to the Rave, I didn't know what to expect. Everyone had been telling us that we would see half the crowd we had our first week. Minus all the out-of-towners that came to our Grand Opening that would have put us at around 100 people. But, that's not what happened. People poured in - you could feel the excitement. And at the end of day, 240 people walked through the doors of The Net. We somehow managed not only to avoid a big dip, but see an increase. In part - I'm sure - due to last week's weather. In part due to the added press we received from another news article about the survey results and a radio interview with local host, Jeff Styles. But, I would say the biggest part came as a result of how touched people were by the whole experience. "What an amazing encounter with God we had - a truly worshipful experience. There were so many things that happened this week that told us we need to make The Net Church our home. We have had the feeling all week that God has been speaking to us about making a decision to leave our comfort zone and follow where He is leading. Today sealed it for us. It has been a long time since I have been excited about going to church and I have never felt this kind of excitement. We brought two families of friends with us this week and they all loved it, as well. Can't wait till next week!" Thanks to every volunteer! Thanks to all who came and came back! Thanks to God for allowing us to be a part of something so special! Yesterday The Net officially launched. The night before left Chattanooga with a layer a freezing rain on the highways. I prayed that God would allow the sun to come out that night and warm things up! Apparently, he did. Sunday morning brought us 40+ degree temps and a turn out of 234 people. The experience was flawless thanks to 30+ volunteers who made it look like they'd been pulling off a church service for years and a God that can't stop loving us! I was overcome with gratitude for all who made it happen and all who came to visit with us. Today the Times Free Press posted the results to our survey in the paper. The online version is available by clicking the following link: Results to the If You Hate Church survey! Over the next four weekends, we will be tackling some of the tougher responses we received from the survey. We hope you'll join us this coming Sunday at 10AM at Rave Motion Pictures! The news has been so good to us. Last week we were interviewed by the Weekly. The writer did a great job of capturing what we are all about. I hope you'll take the time to read it. And I REALLY hope you'll take the time to come out to our Grand Opening this Sunday at 10AM at Rave Motion Pictures. In today's society, pastors are highly scrutinized. Today I have become the latest pastor to be exposed. 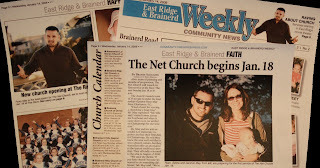 We are a less than a week away from launching our church - The Net. The timing could not be worse. My past is catching up with me. The attached photo was never meant to see the light of day. It was just one night! It was just one photograph!! And it was taken during college... and you know the old saying, "What happens in college...". Unfortunately, this one got out, thanks to the magic of facebook! Yes... 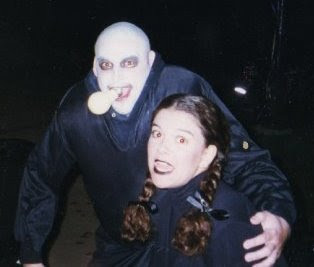 I am Fester. And that doll of a girl is my wife, Wednesday. God help us all for what embarrassment will come to each of us through the technology that has been created in the last few years! Is anyone safe?